In a Tu-154 which appears to have seen better times long ago, we fly from Munich to Mineralnye Vody in the foothills of the Caucasus. Unlike the first impression of the airplane, the service of KMV1 is ok. The immigration form which was handed out at the end of the flight causes some confusion because it is in one language only - Russian. We get through the passport control relatively quickly after it became clear that the group should enter the control as a whole, and half an hour after arrival we are received by the local agency. Three hours of bus drive through violent rain - the bus driver obviously knows the road by heart and doesn't need functioning headlights - and we reach our hotel in Azau (2350 m) at the foot of Elbrus at ten in the evening. Dinner; outside it is drizzling. 1 KMV (Кавказкие Минералные Воды - Kav Min Vody) is the local airline based in Mineralnye Vody. Contrary to all expectations, the weather is not only good but even cloudless. 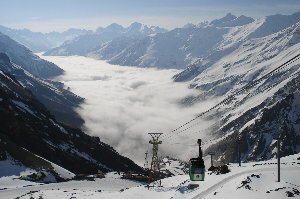 With skis and rucksack in our hands we go up by chairlift to the Cheget top station (2730 m). While the valleys are only partly snow-covered, up here there is still winter. 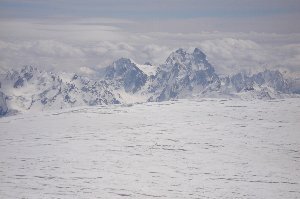 We ascend for two hours along snow slopes on the left side of the ridge and reach the summit of Azau-Gitche-Cheget-Kara (3461 m). 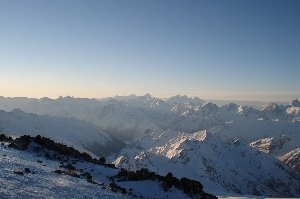 From here we have a nice view to the two summits of Elbrus on the opposite side, and behind us to the Caucasus main ridge. Fortunately it is not very cold. The downhill run on the south side presents a first-class desaster snow: a hard crust which collapses upon load. Only down in the valley the snow becomes softer and better. But soon there is hardly enough snow; we work our way from snowspot to snowspot. We also encounter a rusty military vehicle in the creek. 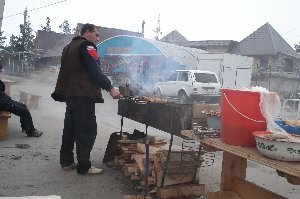 Back in Cheget at 2 pm; beer and kebab (шашлык) in the first restaurant at the beginning of the "village". We leave early this morning - on Sundays the cablecar is said to be quite crowded. 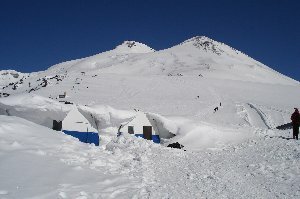 Therefore, we are at the bottom station soon after breakfast at 8:30 and go up two stages of cablecar until station "Mir" at 3465 m. Baggage as well as the cook who will take care of us in the huts are loaded onto a snowcat. 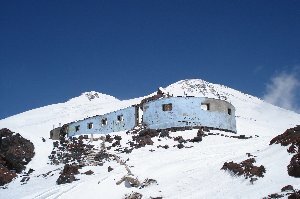 Without baggage we comfortably climb up to the Bochki huts ("barrels" 2) at 3700 m in about 45 minutres. There, a snack is prepared. 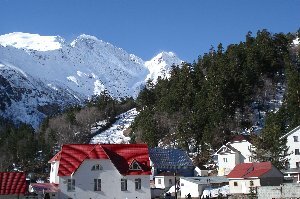 Around noon we go for a short acclimatization trip. 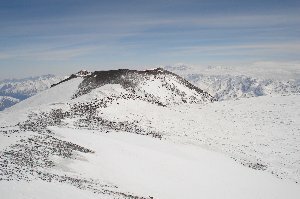 Most of the group go up to 4400 to 4500 meters which takes about 2 1/2 hours. The area is not really lonely, though: Russian skiers are transported up to 4500 m by snowcats; our ascent and descent is along the piste. But we are back to the barrels quickly. Our local guide Oleg suggests for tomorrow to go up again to the Pastuchov rocks at 4600 m and practice the use of crampons there at the bare ice passages. 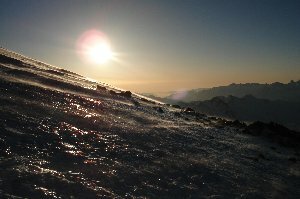 For the summit attempt we would have two opportunities: the first at 3 am from the barrels, by ski only, or at 5 am with the snowcat up to 4500 m and from there on foot. The weather forecast is good, but there is some doubt about its reliability. For today it had foreseen quite bad weather, but apart from some cumulus clouds it was good. Since the weather in this region generally is said to be not very stable, we consider starting a summit attempt as early as tomorrow. This would not really agree with the standard plan, and we have practically no acclimatization - but who knows how long the good weather will last? Claudia and I would prefer to do without the snow cat which the majority of the group wants to use. But the organization with a divided group would become complicated, and the 1900 height meters without acclimatization might be a little tough. 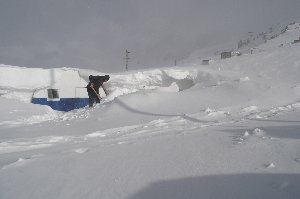 So we will go tomorrow alltogether with the snow cat and try to reach the summit - provided we have good weather. The day after tomorrow, those who might like to do the mountain as far as possible "by fair means" could go to the east summit without the snow cat. 2 Бочка is the Russian word for "barrel". At five a.m. the snow cat brings us to the end of the track at about 4500 m below the Pastuchov rocks. 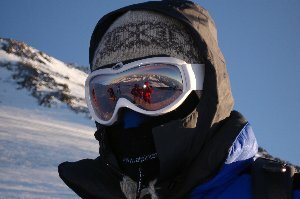 It is cold and very windy (-20°C / 40 km/h), but the weather is good. We will get some sun in at least two hours, if not later. 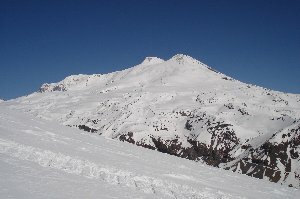 Because Elbrus is standing freely in the landscape without high neighbouring mountains, its slopes are always exposed to more or less strong storms. In the area of the Pastuchov rocks the glacier is usually icy - therefore we leave the skis here for the descent and do all the ascent on foot. The glacier ice is winterly cold, already at a 35° steepness Stephan and Oleg put a fixed rope which turns out to be not a bad idea. Beyond 4900 m there is some snow on the glacier again, but it is very hard and not good for skiing. In the sun, it is a little more comfortable, but wind and temperature are unchanged. 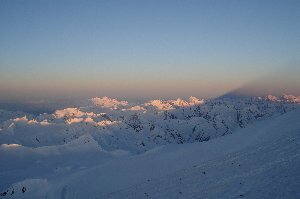 An endless ascending traverse leads us to the left to the Elbrus saddle between west summit (5642 m) and east summit (5621 m). Here there is a little less wind. 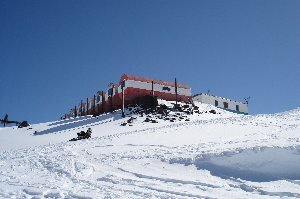 It takes two hours for me to finish the remaining 300 height meters; the main summit - of course - is situated in the opposite end of the summit plateau. 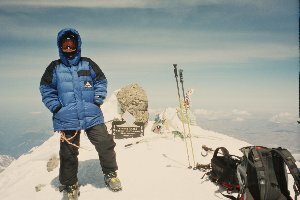 1 p.m., Oleg accompanies me on the summit; most of the others were on the top about 30 to 60 minutes earlier. The weather is already working on producing the afternoon clouds, but still the views are good. 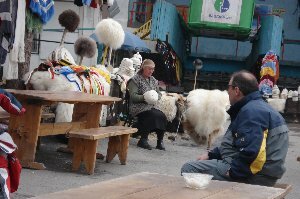 Unfortunately we can enjoy them only a short time, the wind up here is much stronger than down in the slopes. 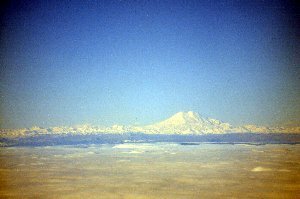 As we are back at the saddle half an hour later, both Elbrus summits are in the clouds. The way back to traverse and ice is long and strenuous; the ski descent to the barrels is also not really fun: The weather has become rather inconvenient meanwhile, the day was somewhat long, and so I am happy to reach the barrels without any stupid fall on the piste. 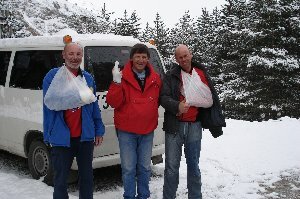 At the Bochkis we see the advantage of good cell phone coverage: Werner had suffered frostbite at his fingers, probably due to insufficient gloves. Our team doctor Georg can get supporting advice about the emergeny medication directly from Germany. In the evening, heavy snowfall sets in. During the night we had 40 cm of fresh snow, the morning is cloudy. After one short ray of sunlight the snowfall goes on. Werner goes down by snowcat and cable car together with our two guides Oleg and Stephan and some rucksacks. 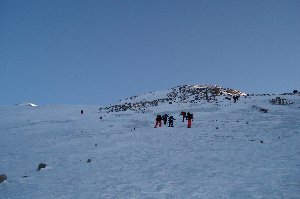 The others go down on the piste to the station "Mir" and further down to Azau. 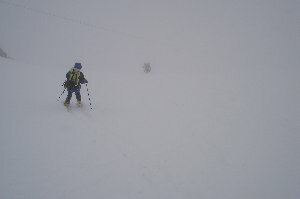 The powder snow joy is rather limited, visibility is low. Beyond the middle station (2900 m) the piste is closed due to lack of snow. A little above the lower cable car station, Stephan Kr. 's descent is suddenly stopped by scree and stones that were only a little hidden by the fresh snow. A shoulder injury is the consequence. Our two injured are examined in the nearest hospital. Tomorrow they will be brought to Mineralnye Vody and then fly to Munich via Moscow. 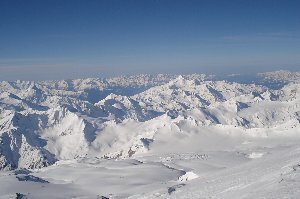 Amical has organized the transport back very quickly, together with the German Alpine Club. Also today the weather is not too good. 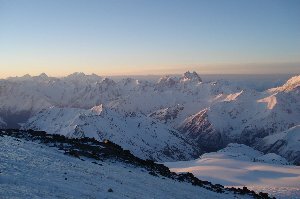 For Elbrus it wouldn't suffice - it was a good idea not to trust the weather from the beginning on and not sticking to the "usual" plan. 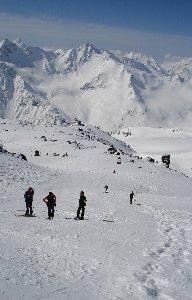 Today we will have a not too long ski tour, about two hours from the middle station of the cable car to Echo Voiny Pass. But at the cable car there is such a lot of people already at 9 a.m., forcing us to search for alternatives. There is no big enthusiasm for the Cheget chair lift and a tour quite the same as on our first day, so we decide to do the ascent to the middle station on foot (by ski). After 1 1/2 hours we are there. Another two hours through endless glacier basins, and we reach the pass (3349 m). 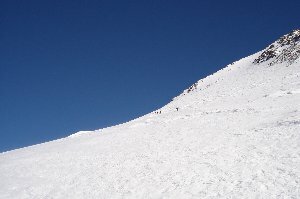 The descent is of poor snow quality in the beginning, but there are some reasonably slopes in the middle. Soon leave the valley over many avalanche remains, until several uniforms stop us - Russian border guard. It takes 40 minutes to check our data; we spend the time in snowfall, being guarded by machine guns. 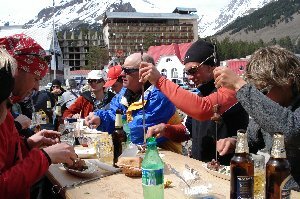 Around four o'clock we are back to the cable car station and devote ourselves to the well-deserved beer and shashlyk (шашлык). On time at 10 am, a but brings us from Azau to Pjatigorsk; during the three hour drive it is continuously raining. In Pjatigorsk we are lodging in the "Intourist" hotel at the Lenin square. Indeed a huge Lenin statue is watching the park. On the market, several militiamen - feeling utterly important - want to control our passports. We hardly have seen such a control mania anywhere else. 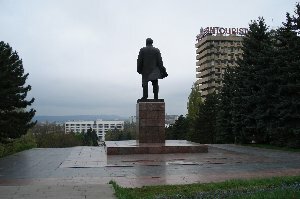 Besides the statue, Pjatigorsk offers no essential attractions, apart from the tram which in western countries would be rather found in the museum than on the streets. 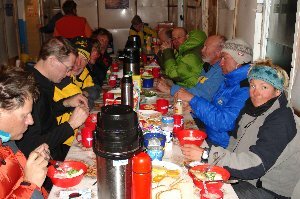 Dinner in the hotel, we receive certificates of our Elbrus climbs. The hotel restaurant still has the "charm" of long bygone socialist times. At 4:30 the night is over. A short breakfast, and at six we are at Mineralnye Vody airport. After several security, ticke and passport controls we enter the apparently only one international flight which the local airline is carrying out: Three and a quarter hours to Munich. There a warm and sunny weather welcomes us. In Pjatigorsk, thought quite some degrees more to the south, it had by far not been so warm.